On The Table Set, I am referred to as the "punch guy." So for our holiday party I knew I really had to step it up and make something special. In lieu of a default sparkling wine punch with cranberries and lemon wheels I delved further, exploring old English Christmas punches and colonial tea-based punches. I came up with this Yuletide Christmas Punch, borrowing from the best and creating a mellow, dry, spicy and earthy rum punch that warms the soul while it quenches. One day ahead, fill a bundt pan with water, cover with plastic wrap and freeze overnight. Prepare strong tea by bringing a quart of water to a near boil. Pour into a heat-proof vessel with 8 black tea bags and cinnamon stick. Set aside to steep and cool. Return saucepan to stove and begin warming a pint of water over medium heat. Rub a lemon in a non-reactive dish of sugar until the sugar takes the color from the lemon, absorbing its oils. Add a splash of hot water and stir to make a paste, or 'sherbet'. Set aside. Add 2 cups demerara sugar to the saucepan and stir until completely dissolved and syrup just comes to a boil. Remove from heat and let cool. Using the tip of a knife, score and stud oranges with cloves to make pomanders. Wrap in foil and place in the oven at 200 degrees for ten minutes or until fragrant. Remove from the oven. In a punch bowl combine exactly half the bottles of Lambrusco, rums, brandy, tea and juices. Stir in the sherbet, and demerara syrup to taste, approximately half of the batch. Remove decorative ice mold from freezer. Place bundt pan into a bowl of warm water to loosen the ice from the mold. Carefully lower ice mold (or block ice) into punch base, and top with one liter chilled club soda. Garnish with pomanders, fresh tarragon sprigs, star anise, and a generous dusting of freshly grated nutmeg. When the punch requires refreshment, add the remaining ingredients and stir until combined. Though I first experienced this salad a decade or so ago in Tucson when my mother prepared it for Christmas Eve (as she does now every year), its origins are in Santa Fe. Throughout the festivities on Christmas Eve ―Noche Buena, the “Good Night,” as it’s known there― New Mexico's lively and vibrant cuisine is paramount. This colorful and refreshing side dish proudly represents Santa Fe's unique blend of cultures and traditions. Preheat the oven to 375 degrees. Clean the beets and remove any leafy stems. Place the beets on a sheet of foil and toss with the olive oil. Sprinkle with salt and then wrap the beets in the foil. Place foil-wrapped beets on a baking sheet and bake for 40 minutes or until you can easily stick a fork into the beets. Once cool, rub the beets with a paper towel to remove the skin. Slice the beets into sticks and place in a large bowl with the Granny Smith apples. Finely mince the zest of one orange and mix with the lime juice, orange juice, salt, sugar and olive oil. Drizzle over the beets and apples, stir to incorporate, and let stand 1 hour. Cut away the rind and all white pith on the oranges. Cut between each white membrane and remove the segments. Reserve. To serve, lay outer leaves of the romaine on a serving platter. Tear the heart to create a bed of lettuce. Scatter with the jicama sticks. Scoop the beet mixture into the center, then sprinkle with the reserved orange segments, pomegranate seeds, and peanuts. Garnish with orange zest and candies. I was reminded by my friend Katie (a New Mexico native) at the Table Set holiday party, where I served this, how absolutely delicious Gruet Brut NV (also from New Mexico) is, and how well it pairs with this crisp salad. Trust me, it will make for a noche buena! San Francisco's Mission neighborhood has a need for new restaurants and bars about as much as I need second dessert. Yet amongst the hullabaloo, a constant star has always been Tartine Bakery. Though I'd peeked into the windows of their younger sister restaurant Bar Tartine, I had not had the pleasure to dine there. Lucky for me, that is where Catherine decided we would dine for her 30th birthday. And did we! As three of the four of us went to college in the Willamette Valley, the Adelsheim Pinot Gris seemed fitting for the celebration. The crisp, clean pinot gris provided a wonderful companion to the vegetable-forward Eastern European-influenced menu. To start, we grazed on duck pate, rye bread, gooseberry jam, elderberry and coriander mustards. And chewy Tartine Bakery bread, of course. A jar of green cherry tomato pickles added a bright accompaniment to the board. Our succession of veggie-heavy small plates started with the smoked eggplant, cranberry beans, and garlic sausage. Rich and smoky, yet somehow (albeit sharing) I did not get a bite of eggplant! Halászlé is a Hungarian fisherman's soup, here comprised of mussels, sturgeon, tomato, green chili, purslane, and fennel. The paprika broth is a bold and delicious base for mussels. A runner up for my favorite, though selfishly I wished for a couple more mussels! The butter boletes mushrooms, yoghurt, turnip sauce, carrot, and radish was an earthy side in the disguise of a stand-aone dish. Not terribly memorable on the shadow of the Halászlé. The side of summer squash, squash blossoms, and curried squash sauce was brought out last. We consumed it vacantly (read: on the side of ubiquitous), possibly due to the coursing order. Might have fit more nicely at the beginning of the meal. The dessert left a little to be desired as well. Layers of sour cream custard, lemon curd, poppyseed, and a cherry/oat/walnut crumble suggested disparate flavors and sensations, but lacked a certain pride that any one of the contents of the Tartine Bakery case exudes. After dinner we walked around the corner to spend the rest of Catherine's birthday sipping drinks upstairs in The Hideout, the back room bar at Dalva (3121 16th St.) The cocktails here are serious, such was the "Whisky In Church": Smokehead Scotch, Oloroso Sherry, and a splash of maple and pear syrup. Holy! Bittersweet amaro cocktails quickly lulled us into pleasant propensity. When I moved out of Portland in 2005, I knew Oregon would always be my home away from home, largely because of the adopted family I was leaving behind. And while PDX is still tattooed on my heart, my last visit to the bay area reminded me that often times people is place. 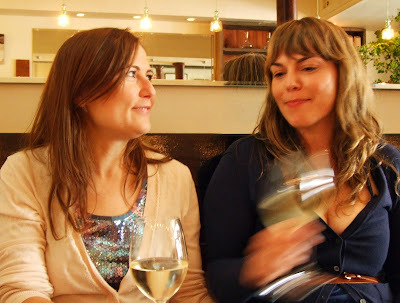 It was my dear friend Catherine's milestone 30th, and I was helping her celebrate in her new city post-Portland. But curled up in her cozy Tenderloin apartment with Casey and Allie Afternoon (their pug) while we ordered-in dinner, I was overwhelmed with the familiar comfort of home. For our first family outing, Catherine decided to make a day out of going to breakfast. We drove over the Golden Gate Bridge and into the Marin Headlands, winding down between the historic officers' residences of Fort Baker. Eventually this lead us to Murray Circle at Cavallo Point. Brunch, with one heck of a view. While we weren't there for the food per se, we were pleasantly surprised. Catherine's house-made granola with organic yogurt and dried fruit was hearty and complex. It was a chilly morning, and I couldn't resist the idea of a warming plate of eggs benedict with bacon, spinach, fresh-baked biscuit, and béarnaise. Classic good times. We polished off the cornmeal pancakes and fresh berries with ease. After breakfast Catherine surprised us with a hike. And so we made off across the green toward the bridge. After soaking in the view, we needed a nap- or a coffee. Coffee won. We visited the revitalized Hayes Valley neighborhood's Blue Bottle Coffee outpost for a little cup of what-what. Craving an afternoon sweet treat, Casey and I walked across the strangely utopian Patricia's Green to Miette for a macaron fix. Rose geranium, please. Deciding where to dine in San Francisco stresses me out. In a city where everything is "good" sometimes finding "worthwhile" gets a little hectic. Beyond the gate, a spacious deck patio leads into an airy interior of high ceilings and concrete, warmed with worn wood and spectral skylight sculptures. Denim napkins. I mean, so hip. It was breakfast, so naturally I ordered a Scrimshaw pilsner. In a cute little glass. Prized company. Casey and Catherine of Coffee Pencil Knife always know where to take me. Of course Andy of the Wind Attack was along. We were skipping out on the Foodbuzz Blogger Fest's farewell brunch, and determined to trump it with the meal ahead. We started with the buckwheat beignets with rum raisins and cream. These fluffy doughnuts melt in your mouth. Into it. Keeping with the dessert first, the crêpe cake with persimmon was next. An impressive stack, brûléed to a satisfying crisp. Casey was feeling Nordic, and feasted on King salmon gravlax with rye, roasted beets and horseradish. Gorgeous, and delicious. Catherine's three scrambled eggs with leeks, rainbow chard, chives and chantrelles inspired. A scrambled egg is an art, and these fellows were golden perfection. Neither Andy or I could resist the corned beef brisket with potato hash, a poached egg and mustard hollandaise, and were happy to not to have to share. Intensely awesome. Oh, what's one more beer? They're tiny.